This is in the beta thread because of a possible inconsistency and/or missed bug. Please comment on browser bug found in v9.0b64 unfixed or missing at approximately version 9.0b69 and the possible absence of this fix in the public pay for version. There is a reference to drives spinning endlessly. Current beta release notes speak nothing of the matter. Regardless, the browser is 100% broken as indexing is a requirement. My 320gb, 5400 RPM external just unnecessarily gained 30 degrees in 20 minutes (laser thermometer) with no results as Ableton foolishly attempts to scan the entire drive. Why are you trying to break my computer? Finder and other applications navigate the drive(s) with no issues. This particular drive is approximately 1/2 full with mostly audio and in excellent working condition. -Large local folders w/many audio samples. The system drive is an SSD and performs very well. Consider the default Mac OSX Finder instance in preference of the over-thought yet half-baked scan first, allow browsing later/never pattern in effect. If am am wrong I apologize in advance. Answer and delete as needed. I will respond to this with a link to the cached version I found on goole. If I am right I call shenanigans on Ableton. Ableton Denver wrote: Please comment on browser bug found in v9.0b64 unfixed or missing at approximately version 9.0b69 and the possible absence of this fix in the public pay for version. Release notes contain information about fixed bugs of the respective version. They do not add up to subsequent versions. 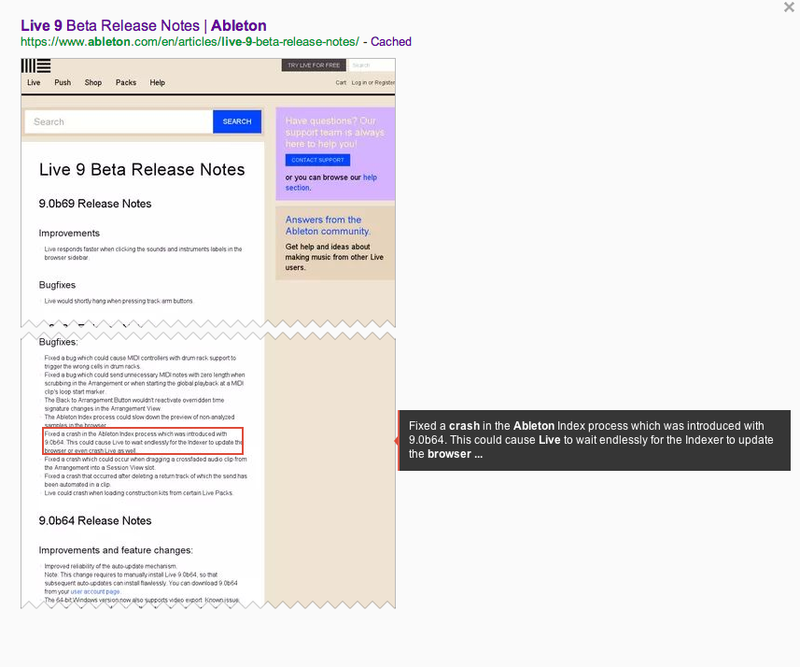 To clarify the actual problem that was mentioned in the release notes for 9.0b65: The "Ableton Index" background process could crash very often when scanning files. This problem got introduced with 9.0b64 after a performance optimization for the indexer process. As Live would not be able to detect such a crash, the little animated graphics in the browser next to "Places" would just spin endlessly, making Live look as if it was still scanning, although the indexer already died. It was not the drive that spins endlessly. Just the animation. The crash was fixed with 9.0b65 and thus mentioned in the release notes of 9.0b65. - at least one user who still experienced a crash with the Ableton Index process, which would lead to a similar side-effects as mentioned above (scanning doesn't finish, animation in browser spins forever). - a few users are reporting that the Index process continuously scans and never finishes, although it is correctly running in the background. We're currently investigating both of these problems. If you experiencing similar issues, please get in touch with our Technical Support Team. We have ways to enable detailed logging on your machine which could help us to find out why it is not working as it should. Turn off automatic scanning, or at least filter out folders you don't want to be scanned (eg temp folders for sample packs you want to check out, CD-ROMs, etc). Add "Scan only when folder is opened"
Scan folder by folder, put the index file for that folder inside that folder. Then make a master index later out of the sub-indexs. I will contact tech support, but they NEVER write back (black hole). My hard-drive has indeed failed, I am in the process of recovering. I was never able to get the index to complete, for example one sample library I own is 2gb of samples where all samples are 1 second or less. My hard drive will fail long before the index completes. Our user group (formerly Ableton Colorado) discussed this last night at our meet up and the general consensus was that changes should not impede the user. This is indeed the case as I can not use my material on another Ableton install until the index completes. Until Live9 I could jump on another persons computer + APC40 and play a set. Now I need to wait for my 20gb live performance drive to get indexed, if is actually completes. hey RE8 - you are on the right path! Another frequent use case scenario; USB Flash Drives. Very very often used to transfer samples & songs. I hope Ableton does some hard-core testing on those also; I know when I save to my Flash Drive directly from my web browser, it will hang the browser for a few seconds. I use an external drive for live performance and the recent changes to the browser is a huge disservice for live performers. My 10-20gb performance drive will take an hour + to scan if it finishes (the length of my set is hmmm... about 1 hour). Additionally - I did some benchmarking and on an above average computer (I teach Ableton professionally and know what the kids use) and my SSD drive was 6 seconds per drum loop of 1-2 measure in length. 6 seconds per loop to index is longer than the loop!!!!!!!!!!!!!!!!!!! My suggestion to Ableton : "We have enabled a feature in options.txt to turn off the indexing requirement." Solved. I am not interested in being a troublemaker, despite conversations the board of directors have had about me. Gerhardt and the others never understood that I fight for the user. This is such a case. Please, stop hurting the users! You are a month or 2 away form the heavy hitters using this application and crying out to 10,000 to 250k user base (per artist) calling full on shenanigans. Do you need a Skrillex railing against your application? Think about what negative impact a grip of artists will have complaining about unsuitability of Live 9 as a DAW just as your old dev team (members) release Bitwig. Sorry to be the single voice of reason here, but this is the reality of the situation. You are in a honeymoon period where you need to listen, react and make a pivot on this element before a negative wave of marketing comes your way that you can not manage or overcome. Might be getting a bit overly dramatic about it; seems many people are using it just fine. & major players have tested it out before (though perhaps not in an on-stage situation). Most of the people I know who use Live9 have no major issues so far. It is not like Ableton made SimCity 5. Though I also find it dishearting that these very real situations were obviously either not tested, or simply ignored. I know of only 1 of 30 live acts that use desktops on stage with Live, & I've seen many laptops with extra drives of some sort. or is it a trick question? 3dot... wrote: I think you're going to pay for it... or is it a trick question? Well, if you bought new tires for your car, then the tread fell off 2 weeks later, don't you think the tire company owes you more than just new tires (since you payed real money to solve a problem or improve performance, & all you got was more problems). & if those bad tires caused your car to crash, don't you think the tire company owes you another car? We're not talking about beta software here, this is a full release that has been in beta for a year. & a somewhat common use case has totally failed. In fact, I'm not sure if the software can legally called "Live" anymore, more like "Live After One Hour of Indexing". hey man.. just joking.. I feel your pain. and if you want even a smoother ride.. I'd delete everything not needed from the Library.. uninstall packs.. etc. I had not added even 1 "place" and I'm guessing this is why I'm having a smoother ride..
as for your moral issue.. I think you need to make a dispute and let the court decide..
all that indexing is... is a catalogue of files. i can hardly fathom how that would destroy a hard drive. i'm not trying to undermine any points being made, name dropping or not, but how exactly is this, which is basically a file search, capable of destroying a drive? i would be griping to the manufacturer of the hard drive, that can't handle a long search, before i would blame the software that is accessing it. seriously, what can Live possibly be doing, during all that drive access (aka reading), that would break anything? are hard drives not meant to be accessed? the only other thing that i could think of is that the motherboard on the computer being used is incapable of handling the speed of the Front Side Bus... that it claims it can manage. I agree with H2Only. If indexing files causes such a spike in drive temps as to actually make it a fire or even a fail hazard, that's a problem to take up with either the drive or enclosure maker. I don't doubt that the temps do go up when in use, that's generally what happens when electronics components go from idle to in-use. When I launch Adobe Premiere Pro and start working on video, I notice sharp increases in temperatures on my CPU's, GPU, RAM, and scratch drive. My library is stored on secondary internal drives, so I can't say I'm directly familiar with the OP's problem or how L9 index files are stored. Perhaps if the index files could be stored on the drive that's been indexed, then it would eliminate the need for an external drive to be re-indexed when plugging into another system running L9. Once the drive has been indexed, the index file could be accessed (and updated, as necessary) by the next machine using it.